Make an easy Christmas craft using felt and paper clips. These festive ice skate ornaments are quick and easy gifts to make and will look great on your Christmas tree. Try this easy homemade Christmas craft with the kids. Using theSkate Template,cut out the skate from your 9 x 12 Soft Felt Sheet. Fold skate shape in half. Slide paper clip, open side into bottom of the skate, into the bottom fold. Glue the side edge's of the skate together. Do not glue all the way to the top. Leave about 3/4" open so you are able to fold down the top of your skate. TIP: Make sure to avoid gluing the paper clip. Place heavy object on the skate until dry. Punch holes with a small single hole punch on right side of skate where you have glued. Cut 12" of the ribbon. Thread your safety needle and start lacing your skate from the bottom of the toe and up to the top of the skate. Cut another 12" of ribbon and begin lacing your skate. Start at the toe using both ends of your ribbon (similar to lacing up your shoes). Double knot your ribbon at the top and tie into a bow. Use a small dot of glue to keep your bow in place. Fold down the top portion of the skate. Punch a single hole in the top left corner. This will be through four layers of felt. Push the remaining piece of ribbon through the hole for the hanger. Tie in a bow. You can use fiber fill to stuff your skate to add extra dimension to it. 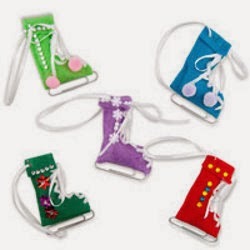 Also, embellish with glitter, sequins, or pom poms to personalize each different skate.